The “Cheers to You” audio CD tries to lift you out of your gloom by reciting encouraging statements accompanied by sounds of applause and cheering crowds. I don’t know about you, but the thought that any person would take such a product seriously sure depresses me. The “Cheers to You” audio CD proudly joins the Hawaii Chair and Shuffles Shoe Mop in the I-Can’t-Believe-This-Is-A-Real-Product category. 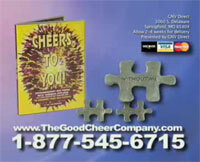 Go to the website www.TheGoodCheerCompany.com and you will find out this TV commercial is not a parody; the CD is really for sale and at only $24.95 it is a lot cheaper than a Prozac prescription. The CD tells the listener “We’re on your side. We’re here for you. Weeee belieeeeve in yoooou!” The “we” in this case is the voice of an anonymous man in a recording studio who has never met you and never will. Who, exactly, would be fooled by this thing into feeling better about himself or herself? And the patronizing tone of the speaker—who sounds like an adult on Sesame Street speaking to a 14-month-old just learning to talk—can’t be helping matters. This commercial tells us that this product was featured on the Ellen Degeneres Show—which puts it in the same league as the Tiddy Bear. Even more puzzling than the CD is the bonus of “three puzzle-shaped affirmative tokens.” Who needs accomplishments, talents, or virtues when you have the words “I am unstoppable” written on a faux puzzle piece in your pocket? The other jigsaw puzzle piece-shaped thing tells the bearer, “Without me the puzzle is incomplete.” Too bad the puzzle is just a picture of dogs playing poker. The motivator’s voice sounds reminiscent of Richard Simmons, albeit less sincere. 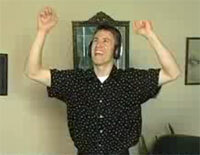 What this CD needs is a David Letterman-esque devil’s advocate to bug the Richard Simmons-esque motivator. 25.00 for a CD that makes you feel better? Bah! You can buy “Queens Greatest Hits” for 10 bucks and feel good without having to listen to anonymous cheers. Oh man,, you should check out their website and listen to those samples, they even have some kind of ‘because of you, for the one you love’ sample that’s just hilarious. I would suggest downloading “Queens Greatest Hits” illegally from the internet, and investing that $25 towards wine consumption. This one belongs to the same category as Klee Irwin’s motivational exercise video. At least there is someone who sells it that sees it as something other than genuine therapeutic material for feelings of crippling inadequacy. However it doesn’t make up for the dismal fact that there is still someone who sells it. For some reason, I highly doubt that this was featured on Ellen’s talk show. I don’t know what you guys are talking about this CD is great! I get pumped every time i do my 20min power walks. This is actually the most depressing infomercial I’ve seen in my life.